Holly Springs is located in southwest Wake County, North Carolina, in the piedmont region of the state. Prior to colonial settlement, Tuscarora Indians used the area for hunting. After the influx of European settlers, the tribe fled and grew into what became the sixth nation of the Iroquois. Holly Springs has a rich history with notable points during the Civil War and World Wars. The beginnings of Holly Springs grew around freshwater springs, believed to be the original “holly springs,” near the intersection of modern-day Avent Ferry and Cass Holt Road. These roads were links to Raleigh, Fayetteville, the Cape Fear River, Hillsborough and Smithfield. By 1800, the town was home to a general store, Baptist church, and Masonic lodge. Following construction included a cotton gin and sawmill. Archibald Leslie, a Scottish tailor, arrived in 1817, opened a tailoring business and built a home in the area. 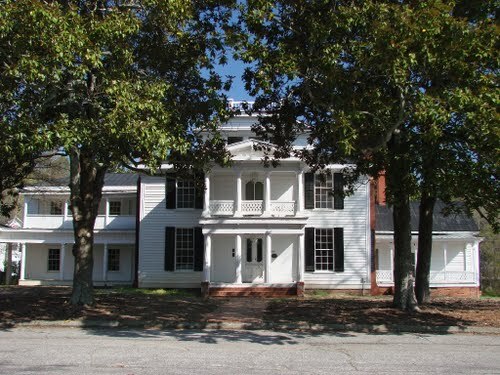 This 38-room-mansion is now known as the Leslie-Alford-Mims house (pictured in the photo above), near the modern-day Town Hall. During the Civil War, Holly Springs became a virtual ghost town due to the lack of male figures. During the Union Army’s march north, raiders known as “bummers” invaded the town and took over the farm lands, obtained food and anything of value. A section of the Union Army occupied the Leslie-Alford-Mims house. The occupant Mrs. Leslie loved her home so much that she treated the soldiers to occupancy and saved the house from destruction. Desertion of the town was also fueled by the bustling railroad town of Apex, North Carolina. In 1875, George Benton Alford moved to the town and revived it through construction, business success, and political prowess. By the arrival of the first World War, the town’s population had increased and plateaued around 300. Business and upcoming schools drew in newcomers. Unfortunately, the onset of World War I thrust the town back into its ghostly history. The town floundered between the first and second World Wars, becoming stagnant. In the 1960s, businesses flourished and the expansion of Highway 55 provided benefits. In 1987, the first sewer plant brought the largest influx of newcomers to the town. Larger companies such as Novartis and Bristol-Myers Squibb also brought an increase in population. The construction of the I-540 connection has augmented the expansion of the area. Town leaders are confident in the growth of the town, especially with the town’s proximity to Research Triangle Park. 2.6% of families and 3.7% of the Holly Springs population live below the poverty line. 2007: Holly Springs was ranked the 22nd best small town to live in, according to a CNNMoney.com evaluation.